What's it about? Due to some celestial mumbo-jumbo involving a 'convergence of realms', the entire Universe is under threat from the Dark Elves. 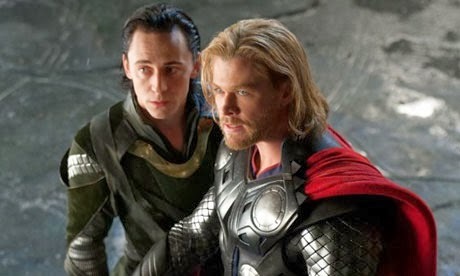 In order to face this threat, Thor (Chris Hemsworth) must enter into an uneasy truce with his brother Loki (Tom Hiddleston), who has been imprisoned on Asgard following his naughtiness in Avengers Assemble. Special effects ensue. Is it any good? It's okay, competent enough to be watchable, but a rather inconsequential addition to the Marvel canon. As with the first Thor and Avengers Assemble, Hiddleston's malevolent Loki is the best thing in it and the only one who threatens to be a fleshed-out character. Sadly, he is underused in a perfunctory save-the-universe plot, which hammers along with scant regard for things like relationships, tension and anything resembling logic. For example, a driving force of the plot is the death of one character, but you might not notice that has happened, so quickly do people get over it. Instead the film prefers to deliver many shouty-fighty-thumpy action sequences (Please Hammer! Don't hurt 'em! ), which get tiresome rather quickly. There's a couple of chucklesome lines from Stellan Skarsgard as the mad scientist on Earth, and the special effects are great, but it's mostly forgettable guff. Plus I'm always suspicious of those post-credit sequences, one here revealing Benicio del Toro as The Collector (whoever that is), which feel like an apology to the audience; "Sorry that wasn't that great. But here's some other stuff coming soon which will be great. Honest!" Anything else I should know? I'm bored talking about Thor. But here's a video of Leonard Nimoy as a cartoon Spock singing If I Had a Hammer. No need to thank me.